Pancho, the light gray gelding who was well-known as the sidekick and lead pony of two-time champion Curlin throughout his stellar campaign, continues to live the good life in the absence of his retired buddy. After receiving a couple requests for an update on the strapping Quarter Horse, I decided to call Scott Blasi, assistant trainer to Steve Asmussen, to check on his status and current whereabouts. Blasi said Pancho, who was shipped to Oaklawn with a group of Asmussen’s racehorses following the Churchill Downs fall meet, will go to Saratoga for the summer. Pancho, who Blasi believes to be around 20 years old, will continue to travel the country and do his job as long as he remains in good health and enjoys his work. Pancho, who garnered a considerable following among horse racing enthusiasts, and even has a facebook fan page, served as Curlin’s faithful companion throughout his campaign. 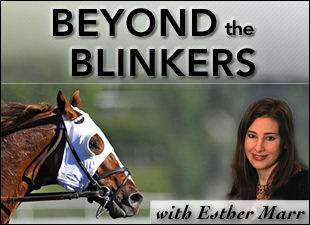 Pancho accompanied Curlin around the United States from California to New York, and even traveled with the chestnut to Dubai for his 2008 World Cup (UAE-I) victory. Blasi said he let Hall of Fame trainer D. Wayne Lukas, who was in need of a track pony, borrow Pancho for awhile at Churchill last year. “Wayne and (Pancho) have a lot in common; they’re both getting up there in years,” Blasi joked. When asked about Pancho’s relationship with Curlin, Blasi said he thought it worked so well based on the mutual respect the two horses had for each other. When it comes time for Pancho to leave his pony duties and kick up his heels for the rest of his days, Blasi stressed the gelding would be kept at a good place. 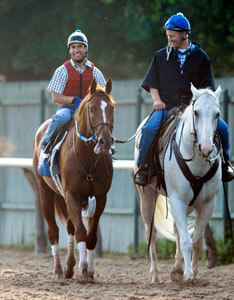 Click here to read a 2008 Morning Line entry about Pancho and Curlin in Dubai.